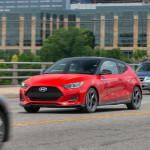 When I first saw a Hyundai Veloster back in 2014 I thought it was an odd little car with an odd sounding name. It made me picture a small plant eating dinosaur who was timid and stayed out of sight. After a week with it I sort of liked it. It grew on me you might say. Still, with little spark under the hood I still couldn’t shake that image of a little dino would couldn’t run very fast. Fast forward to today and that little dino has grown up, and it’s gotten its legs. 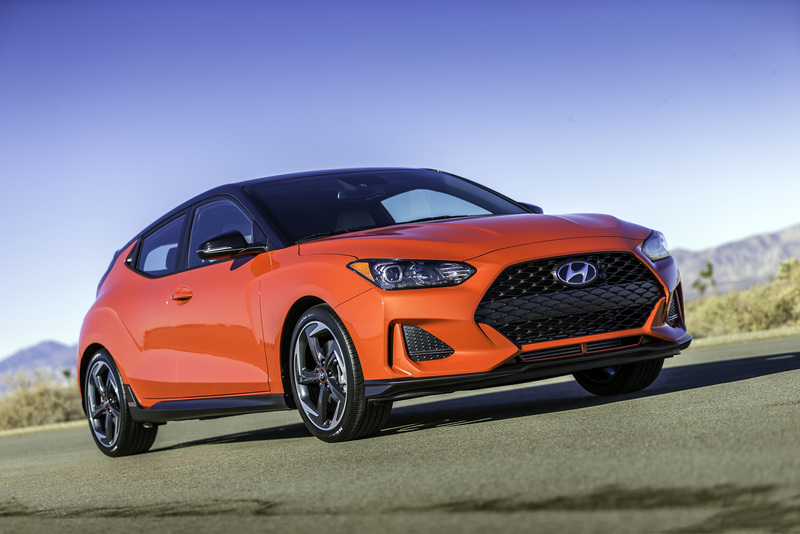 Since my foray with the Veloster they put a turbo under the hood, a bit more power, which is just what it needed. They of course kept the turbo for 2019 and made this cool little funky car just a bit better. Yes, they kept the door. 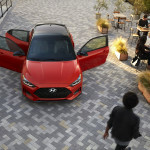 You see the Veloster isn’t a two-door hatchback; thanks to single driver-side door and two passenger-side doors getting backseat passengers in and out doesn’t require yoga lessons. There’s been a redesign of the exterior with a new asymmetrical design that carries over to the interior. This new design makes it look less boxy and indeed more asymmetrical. The lines now look a bit racier. The new interior adds more cargo room, 19.9 cubic feet behind the back seats which is more than the Mini Cooper, Mini Clubman and VW Beetle. Something I felt was sorely needed. 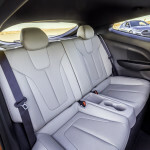 That new interior also gains headroom and room overall. It’s still a small hatchback, but it just doesn’t feel as small. There are five trims; base, which has a 2.0-liter engine, the 2.0 Premium, Turbo R-Spec, Turbo and Turbo Ultimate. 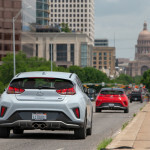 Under the hood the 2.0 variants get a 2.0-liter inline-four (147 hp, 132 lb-ft) while the Turbo models get a turbocharged 1.6-liter inline-four (201 hp, 195 lb-ft). 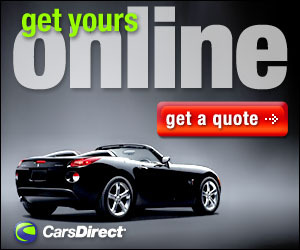 A six-speed manual transmission as standard, but a six-speed automatic can be optioned in. All the lineup gets standard features like a forward collision mitigation system, lane keeping assist and a rearview camera. 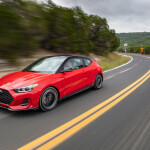 The 7-inch infotainment system features standard Apple CarPlay and Android Auto connectivity, Bluetooth, two USB ports and a six-speaker sound system. The Premium lineup adds a blind-spot monitoring with rear cross-traffic alert; along with standard luxury equipment that includes a sunroof, automatic climate control, heated front seats, and a proximity entry system with push-button start. 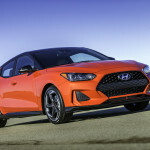 The infotainment system gets a boost as well thanks to an 8-inch display, Hyundai’s Blue Link connected services, a standard wireless charging pad, and an eight-speaker Infinity audio system with satellite radio. The Premium models ride are on 18-inch shoes as opposed to the 17-inch on the 2.0 models. The R-Spec can only have the manual transmission and has a sport-tuned suspension; the Turbo Ultimate which I had for the week, had a seven-speed dual-clutch automatic transmission and special interior trim. 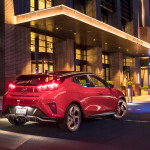 On the road the Veloster isn’t a throw you back in the seat sports car. But with the 1.6 turbo and the seven-speed dual-clutch automatic dialed into Sport mode, it sure is a lot of fun. 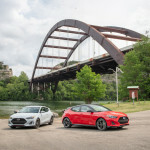 With the new look, more room inside and the good in-car technology this capable little hatchback is a definite player alongside the Civic and Forte. 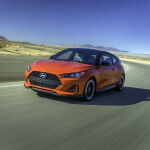 This new generation Veloster still has that funny name but now it’s even better than before. Base Curb Weight: 2987 lbs.